Here are the updated season stats for your Phoenix of East Nashville. Despite an early lead under threatening skies, your loyal Phoenix were unable to hold off the talented Franklin Farriers on Sunday at Carnton Plantation, finally falling 16-12. A 10-man East Nashville squad fought valiantly throughout, succumbling only scant minutes before the terrible storms lashed Middle Tennessee. A tip of our (wet) caps to the Farriers and to all the cranks who braved the elements to join us – Huzzah! Phoenix Hold On for Hard-Fought Victory in Knoxville! Your Phoenix of East Nashville travelled to Knoxville to take on the Emmett Machinists in a special double-header day at World’s Fair Park. On a warm day on a fast, bouncy field, Phoenix took a 4-3 lead after the first inning and then held on to squelch a 9th-inning rally by the Machinists, escaping with a 12-10 victory. 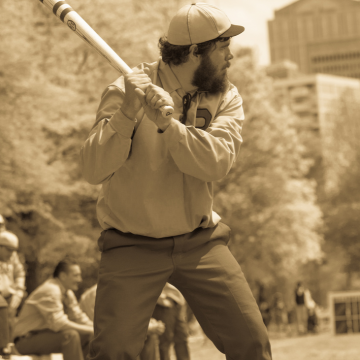 A tip of the grey caps to our opponents and the good people at the park – Huzzah! August 5, 2015 Jay "Udder Guy" Kauflie in The Washington Post! June 26, 2015 Phoenix Hold On for Close Victory at Carnton!